As a pastor in Memphis twenty-something years ago, one day I picked up a national Catholic publication and read a talk by the Bishop of Yakima, Francis George. I cannot recall the topic, but I do recall my reaction. Here was a clear voice, a voice I wanted to listen to, a pastor who helped me understand the faith and taught me how to teach it. From that point on, whenever I noticed Bishop George’s name associated with a talk or an article, I read it. I was never disappointed. Years later, a bishop myself, I heard the voice speak in person, and I found the same clarity, the same creativity, the same natural interplay of faith and reason, the same challenge to discipleship I had perceived in his written word. And I noticed something else: Cardinal George spoke not only from prepared texts but also frequently off the cuff, spontaneously from the heart, in an understated, almost under-his-breath, manner. And I learned that such “after-thoughts” were just as insightful as his written texts. They welled up from within, unrehearsed, and gave a glimpse of the fullness that was his interior life. In a certain sense, he couldn’t not put these afterthoughts to words (although perhaps he wished, from time to time, that he hadn’t! ), because they were so much a part of him, from the tips of his toes to the top of his head. They literally rolled off his lips, because as the Lord had said, “From the fullness of the heart, the mouth speaks” (Mt 12:34; Lk 6:45). I always listened to his afterthoughts, and a personally memorable case in point was spoken here, at this pulpit, 7 or 8 years ago. I had concelebrated Mass with him for the young adults of our two dioceses, during which I preached a quite forgettable homily. After Holy Communion, theCardinal walked to the pulpit and offered some unforgettable, off-the-cuff, closing remarks. One echoes within me to this day. I pondered those words for a long time, and over the past few weeks, as he neared death, I became aware of similar remarks he put to paper through the years. He was fond of reminding us that our relationships with the Lord and with each other are all that endure – all else goes to the grave. He concludes the foreword of his forthcoming book, A Godly Humanism: Clarifying the Hope that Lies Within, with familiar thoughts:Pope Francis often contrasts our planning with God’s providence. God is a God of surprises, Pope Francis explains, and the final horizon is God’s infinite love. It can never be completely responded to; but as the years here go shorter, it fills in with the realization that, just as we pray to see God face to face, so God wants to see us face to face. We give him our time, which is all that we have, and he takes the gift and calls us when he is ready to do so. “The only thing we take with us when we die is what we have given away… the only things that endure are our relationships with God and with others… we give him all that we have, and he takes the gift and calls us when he is ready to do so…” Spontaneously, from the fullness of his heart, Cardinal George gave to the Lord and to us, and both his written words and his unedited afterthoughts brought to light a profound interior life motivated by hope, hope in the Lord. Doesn’t it make sense that an Oblate of Mary Immaculate would ever strive to make an oblation – an offering – a sacrifice – a gift – of his life? And that his oblation would be grounded deeply within, grounded in hope in the One by whose sacrifice alone we are saved? Yes, perfect sense. But what did Francis George offer to God, and through God, to us? What did he give away? He offered a life joined to the Cross of Christ. When the polio virus attacked him at age 13, he learned early and quickly that suffering is not hypothetical but real, that pain is palpable and can have lasting implications. Only the Lord knows the stuff of their many conversations about that dreaded disease and another that would eventually take his life, but there is no doubt that they were spirited conversations – for the crosses of Francis George transformed him both exteriorly and interiorly into a man of compassion for all who suffered, no matter the cause. It was with the Lord’s own love, poured out on the Cross, that he loved us. The book of Genesis recounts the night Jacob wrestled with the angel of God until dawn, when the match left him limping after the angel struck and dislocated his hip. Jacob realized something divine had taken place, and he said, “I have seen God face to face.” Francis George’s own lifelong wrestling in a body struck by polio gave him lasting insight into the mystery of the Cross, through a wound that was somehow not just his but also Christ’s. He offered a life of faith, conviction, and courage. In the end, all of us need a rock foundation. Otherwise, as the Lord said, when the rains and winds come and buffet our house, we cannot stand. With heart and soul and both legs firmly planted in the Lord, Francis George lived a faith-filled life grounded in the conviction that, quite simply, God is everything. When one is convinced – deeply committed to a truth – then that truth becomes the guide and arbiter of every aspect of his life. The Cardinal’s faith was simple, direct, without pretense or embarrassment, spontaneous, bold, profound, and even childlike. He was so utterly a Christian, so utterly a priest, that no circumstance or setting would have seemed to him inappropriate to give witness to Christ. He was convinced, as St. Paul was, that God is for us in a complete and uncompromising way, and that nothing – nothing at all – will be able to separate us from the love of God in Christ Jesus our Lord. Thus convinced, how could he not give witness to Christ everywhere, from the pulpit to the public square? He offered a soul devoted to prayer. If God is everything, then prayer becomes one’s lifeline. Prayer in solitude, unseen, at odd hours and at all hours. Prayer in common, with brother bishops and priests and deacons and religious and all the faithful of the Archdiocese. Prayer with those who have been harmed by the Church. Christ’s own prayer in the sacraments, especially the Holy Eucharist and the Sacrament of Penance. For Cardinal George, prayer was the integrating factor of the Christian life, through which his relationship with God was nourished, sustained, and bore fruit both in love and in intellectual pursuit of the Truth. Make no mistake, the homilies he preached, the classes he taught, and the pastoral care he gave flowed gently and compellingly from a life devoted to prayer. That is to say: all these things flowed from God through the friend and minister of God, Francis George, to us. He offered a brilliant mind in love with God. No one could ever dispute the extraordinary intellectual gifts God gave Francis George, nor could one ever dispute the enthusiasm with which he put those gifts to work for the good of the Church and the world. I often consoled myself with the thought that though I could never have written the books he wrote, or prepared the talks he gave, I could understand them – but even that understanding came from his keen ability to communicate clearly what he believed. When a mind is in love with God, the pursuit of Truth flows effortlessly along the vital relationship between faith and reason. When the pursuit of Truth is fueled by a life of prayer, it is undertaken in communion with Christ, the Wisdom of God. And when one is joined to Christ, the Savior of the World, then the beauty and mystery of the world become the object of one’s love. For whom and what Christ loves, the mind given to Christ loves. He offered a vision of the New Jerusalem. As an Oblate, Francis George yearned for a life of mission, yearned to be sent wherever and to whomever the Lord would have him go. With an acute sense of God’s infinite love for the human person and humanity as a whole, he saw in human culture the traces of God’s handiwork and thusa doorway to God himself. The connection between faith and culture would fascinate him his entire life. Enlightened by prayer and love, impelled by the Christian vocation to evangelize, made bold and strong by the fire of the Holy Spirit, it took him literally around the world. In the vision of a New Jerusalem where God is all in all, Francis George saw the Church as a living witness in every human circumstance, whether frustratingly mundane or bewilderingly tragic. For where human life is found, there Christ desires to dwell in his Church, loving, healing, teaching, listening, feeding, leading, accompanying, giving to drink from a well that will never go dry. Since the earth is also God’s creation, and since we humans, the crown of that creation, cannot save ourselves, Christ makes all things new through the Church, the New Jerusalem. As Cardinal George preached one Easter Sunday,We see only the results of faith and hope and love, but we live in our deepest reality when we are in their grasp. Saints Mary Magdalene, Peter and John, when they were coming to believe but still not fully understanding, ran to the place where they learned to believe, to the person in whom they placed their hope, to the beloved Lord who shows us that revealed truth and self-sacrificing love are more real, more trustworthy, than anything else. If the earth is our mother, then the grave is our home and the world is a closed system turned in on itself. [But] if Christ is risen from the grave and the Church is our mother, then our destiny reaches beyond space and time, beyond what can be measured and controlled. From his heart’s abundance flowed not only his words, but also his very life’s oblation. 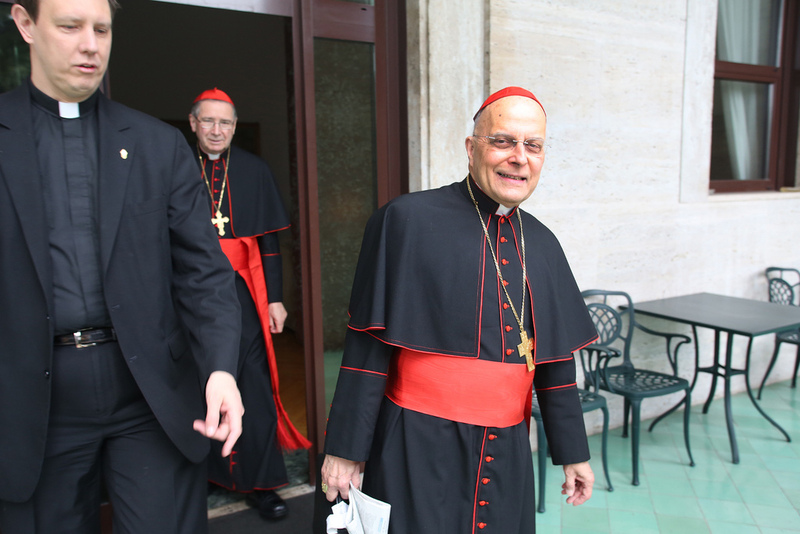 What did Cardinal George offer to the Lord, what did he give away? He offered a life joined to the cross of Christ; a life of faith, hope, conviction, and courage; a soul devoted to prayer; a brilliant mind in love with God; a vision of the New Jerusalem. Because he gave these things and more away, he took them with him to meet the Lord. Such is the topic, as I have presented it, for our inquiry and discussion… If I lack either the time or the ability to study the implications of so profound a mystery, he who speaks within you even when I am not here will teach you better; it is he whom you contemplate with devotion, whom you have welcomed into your hearts, whose temples you have become (Sermo 293). What Francis George received, he handed on to us. So has it ever been in the Church, and so shall it ever be, now through you and me.